Separate the chard leaves from the stems and cut into about 2 inch pieces. Add the chard stems. Let boil for about 4 minutes. Add the leaves. Boil for about 2 minutes more, or until the stems are tender. Put the chard in cold water and drain well. Toss the chard in the dressing and serve. In a liquid measuring cup or jar, combine the olive oil, tahini, 2 tbs lemon juice, mustard, maple syrup, salt and several twists of black pepper. Whisk until thoroughly blended. Add the cold water, and whisk again. The dressing should become remarkably creamy. Taste, and add more lemon juice for zing, and pepper, if desired. If your dressing is too thick to drizzle, whisk in more cold water, 1 tablespoon at a time. Serve. 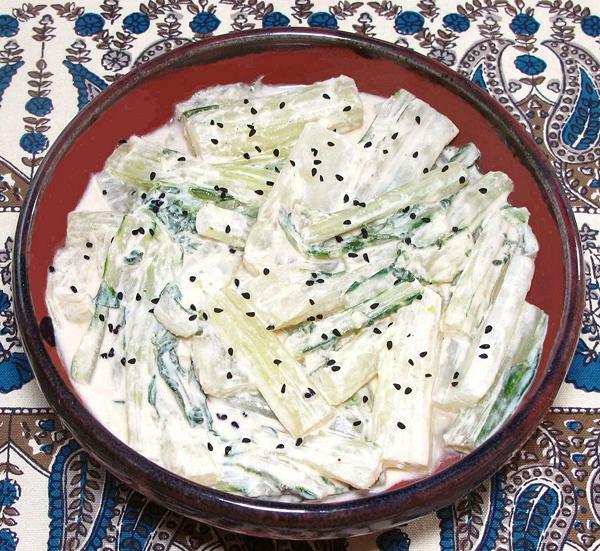 You can make this dish with just the chard stems, or include the leaves for added texture.